Two Iowa business owners joined at a statehouse news conference to voice their opposition to a bill that would change Iowa energy efficiency programs. Jennifer Steffensmeier, president of Steffensmeier Welding and Manufacturing in Pilot Grove, said the bill would hurt businesses like hers that depend on utility company rebates to make their operations more energy efficient. Her firm recently spent $20,000 installing energy efficient light bulbs. She said the $9000 rebate from Alliant Energy for that light-bulb switch made that do-able, but the bill would reduce rebates in the future. Abraham Lamark owns L & L Home Solutions. The Des Moines firm installs insulation in homes after a MidAmerican Energy audit and helps homeowners fill out the paperwork to get MidAmerican rebates. Lamark said his company would go out of business if the bill becomes law and he predicts many of the 21,000 Iowans who work in companies that are involved in energy efficiency projects would lose their jobs, too. 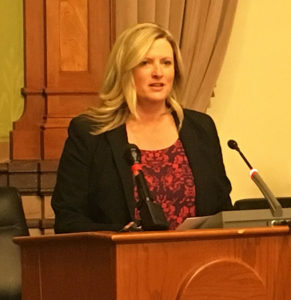 Amanda Zwanziger, a consultant from Indianola, also spoke at the statehouse news conference this morning. She served on the group that helped then-Lieutenant Governor Reynolds draft the Iowa Energy Plan Reynolds released in 2016. “This bill contradicts every pillar of the Iowa Energy Plan that me and hundreds of Iowans had input on and many of the policies that have led to Iowa’s cost-effective energy leadership,” Zwanziger said. Last week, Reynolds told reporters she would not comment on the bill until legislators come up with a final version.